Room Decoration Eiffel Tower Ornaments X2 & Shabby Chic Wall Plaque Picture X1. Two different sizes. Bronze sort of colour. It is supposed to look like shabby chic. Pink, black, grey and cream colours. Tall : 18cm tall. Color : Bronze. You may also like. Our goal is to make sure that you can find exactly what you are looking for and make it easy for you to place your orders. Tall : 18cm tall. Color : Bronze. Our goal is to make sure that you can find exactly what you are looking for and make it easy for you to place your orders. 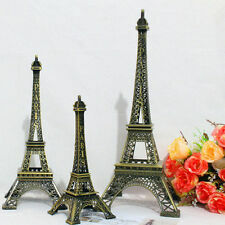 Paris Eiffel Tower Figurine Statue Model Decor 31CM Vintage Bronze. Condition is New. Dispatched with Royal Mail 2nd Class. Features: Excellent handwork, good quality Very good to be used in bedroom, home, bars, cafes, restaurants, wedding, party and other romantic places Great gift for your friend or children. It is perfect in quality and details. Description: Western-style crafts, an excellent element to make a romantic atmosphere, suitable for various occasions. Simply put a pick into the top of a cupcake for an instantly decorated cake! Our cupcake decorations are printed on to high quality paper and attached to a food safe bamboo pick. Each image is double sided. 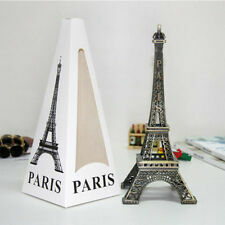 Eiffel Tower *White Ceramic Ornament* Paris* Decoration* H 39cm* Gisela Graham. Condition is New. Dispatched with Royal Mail 2nd Class. The Colorful Eiffel Tower Nightlight made of acrylic material perfectly emits the soft light of LED light. It can be used as a desk lamp, night light, and also a wonderful decor in parties with colorful visual effect by rotating different colors. By Gisela Graham. Eiffel Tower. Position the adhesive on a plane surface without pressing them, so that it let's possibility to withdraw them and reposition again,if needed. Choose a smooth, clean and dry surface. Peel the stickers from the sheet one by one. Position the adhesive on a plane surface without pressing them, so that it let's possibility to withdraw them and reposition again,if needed. If the result is satisfactory for you, stick firmly to the surface pressing the air bubbles outwards. Material Acrylic. Colour Black. Size (W) 14cm, (H) 18cm. Eiffel tower. Silver Glitter Eiffel Tower Tree Decoration. Silver glitter finish. Iconic tree decoration. Easy to hang from your tree. theUK's leading water feature, garden and Christmas Lights specialist. Our working schedule: (not include weekend sorry for delayed replay at weekend).